Whether your home is heated by a forced-air furnace, an oil-fired gravity furnace, electric radiant heaters, a heat pump, or some other means, the key to affordable comfort is making sure that you have an efficient system that’s operating properly. Older, inefficient heating systems—or improperly maintained equipment—can waste a tremendous amount of energy. If you are in the market for a new, high-efficiency heating system, now is the time to consider buying. Incentives and rebates are available from some state governments and utility companies—these can save you hundreds of dollars when you purchase a qualifying model. This section of HomeTips will guide you through issues related to buying new heating equipment, installing certain types of appliances and materials that affect your home’s heating, repairing problems with furnaces, and basic maintenance. When buying a new furnace, it is critically important to choose a model that will heat your home quickly, completely, and efficiently. To do this, you will need to understand the various types available, how efficiency is rated, and how to choose just the right size—one that it isn’t so large that it wastes energy but is large enough to heat your home sufficiently. 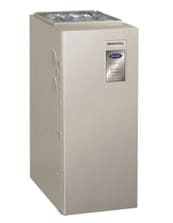 For a complete guide to buying a new high efficiency furnace, see Buying a High-Efficiency Furnace. For their heat source, furnaces use either natural gas, liquid propane, oil, electricity, or even wood or wood-based pellets. Where available, natural gas tends to be preferred because it is clean-burning, piped directly into the house, and relatively inexpensive. 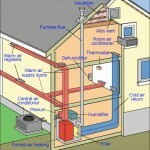 In contemporary homes, ducted air systems are the most common type of central heating and cooling. There are two main types of ducted systems: forced-air and older gravity furnaces. Forced-air furnaces are by far the more common of the two. Though both forced-air and gravity furnaces take advantage of duct work to circulate room air through the heating system, forced-air furnaces have a blower to assist delivery. They can be combined with an air conditioner or heat pump to deliver cooled air in the summer. For more about how they work, see How Central Heating Works. With an older gravity furnace, convection currents (caused by the natural tendency of hot air to rise) carry heated air through the system from a furnace that is located on or below the main floor level. Gravity systems tend to have very large air ducts and can only deliver warmed air. Because they don’t benefit from modern technology, they are big energy wasters. If you’re not sure whether your furnace is a gravity furnace or not, see Gravity Furnaces & Steam Boilers. Don’t put off dealing with furnace problems. At the very least, they can be uncomfortable and/or waste a lot of energy. At the worst, they can be dangerous. Though it is necessary to call a qualified HVAC repairperson for many issues, you can handle some types of diagnostics and repairs yourself when given some basic instruction. For step-by-step information on solving common furnace problems, see Furnace Troubleshooting & Repairs. 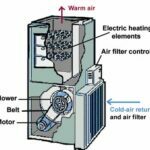 Installing a new forced-air furnace is beyond the skills of most homeowners, but there are a number of things you can do to your home to help with the effort toward heating it efficiently. For more about this, see 9 Tips for Heating Efficiently.